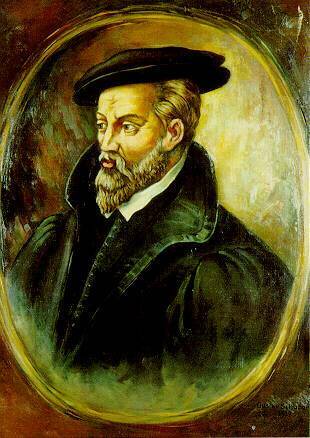 Georgius Agricola (the Latinised version of his birth name George Bauer), was a German Catholic, humanist, scientist and engineer. There’s not a lot written on him, but the Wikipedia entry is a good introduction for our purposes. Agricola devoted himself to philology, philosophy, medicine, physics and chemistry as a young man, as part of the “New Learning” of Renaissance Humanism. He was a town physician in Joachimsthal (in the heart of Germany’s ancient industrial centre), where he made many of his early observations on mining, engineering and other ‘metallic arts’ or mineralogy and metallurgy. He was friends with the greatest scholars of his day – Erasmus, Melanchthon, Meurer and Fabricus – and was admired by each of them, save in his Catholic faith, which caused him to be expelled from several posts in several Lutheran German states. He died, apparently, in a fit of apoplexy brought on during a discussion with an irksome Protestant theologian. Such was the violence of the theological feelings against him in his final home at Chemnitz that his body was refused burial, and had to be carted 50km away to Zeitz. He published very widely – not only on mining, geology, mineralogy and allied subjects, but also on medical, religious, critical, philological, political and historical matters. De re metallica was his greatest achievement. It was the first authoritative (and exhaustive) account of mineralogy and metallurgy to be written; and the work remained the premier account of the subject for 180 years. It passed through 10 editionsns in three languages in a few short years. As learned as the book is, most of the information seems to be new – and is certainly not found in the works he cites in his preface. He personally supervised the drawing of the woodcuts (the first technical drawings of their kind), though the woodcuts themselves were completed after his death – the book being published in 1556. 3. Do these images have value outside of the metallurgical context? What values? 5. In a text abounding with dogs/animal workers; trees/timber are there ecological concerns to this text? 6. Completed in 1550, to what extent is it useful to talk about this text in terms of the temporal and philosophical epochs medieval/early modern, and Renaissance / humanism? 7. Rationalisation and myth – how do we read these in the text? 8. Why do certain sections not have accompanying illustrations? Cf. Book I and the PDF on Health of Miners? How do we read the silence of the illustration? 9. Do the images carry meanings that the words do not?